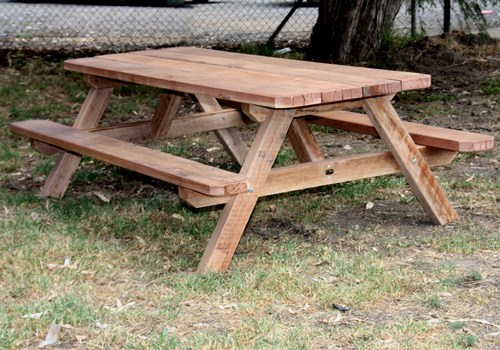 TK Tables build solid wooden picnic tables Melbourne wide and interstate. 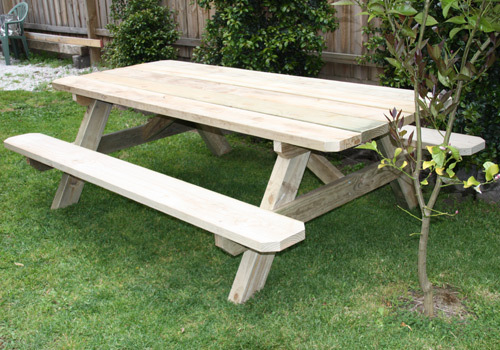 TK Tables manufacture solid heavy duty outdoor wooden picnic tables in a large range of sizes and styles. With Melbourne's best prices and choices on these quality tables it's no wonder that they are so popular. These commercial tables are affordable, sturdy and relatively maintenance free. The conventional A frame outdoor picnic tables come in a large range of materials and sizes. We have over a dozen variations to choose from and that is only the standard sizes. We can adjust any of these to make it fit into that tight location. For pricing click here. These outdoor wood picnic tables start from $688 with several design options available. They are extremely solid and we even offer a couple of commercial grade ones designed to be used in parks and gardens in remote, humid and moist conditions. One of the key benefits that we can provide is customisation and as is not simply the lengths. The overall width of a table has significance in whether the table becomes a romantic intimate table as with our narrow tables or a social interchange table as with our 1m wide tables. Treated pine wooden picnic tables are extremely affordable but nothing is as solid as an ironbark wooden table. Ironbark or greygum is an extremely heavy duty wood that naturally resists weathering. The main difference between treated pine and ironbark is that ironbark is more rustic in its final appearance whereas treated pine has a finer finish. The outdoor wooden table photographed on the right is 2.4m long and weighs approx 260kg whereas the equivalent treated pine table comes in at under 130kg. This outdoor wooden table has its frame is made from 100x75mm solid ironbark/greygum and the benches and tops are made from 200x50mm solid ironbark. Whether it's for a public or commercial site somehow an outdoor wooden table connects us to the outdoors and enables us to leave the pressures of general life behind us for a while. For most of us dining outdoors is a pleasurable experience and gathering around an outdoor picnic table brings fond memories. Keep you eye on our monthly specials page for some of the best wooden tables Melbourne offers and remember that we also provide a price match guarantee. TK Tables takes pride in building their outdoor picnic tables to the highest quality, and this is often reflected in the feedback and comments that we receive on delivery. Our attention to detail and the way we select our timber often exceeds our client's expectations. Outdoor picnic tables that have the TK badge are a sign of quality and pride, both for us and our clients. Since we make everything to order, the final shape, wood selection and surface finish is entirely up to you and what will best work with your needs. So whether you need a simple treated pine picnic table for the back of the sports oval or a fully dressed and oiled smooth finish for your sheltered cafe that is easy to wipe down, we can cater for both extremes. All are solidly built and will give years of service and all outdoor wooden picnic tables with a TK tables badge come with a price match guarantee. The images above are of our standard picnic tables made from 50mm thick timber. We also manufacture a large range of commercial outdoor picnic tables made from sleepers. Furthermore, outdoor picnic tables are not restricted to 'A' frame designs and we offer a huge range of alternatives with wider seats, and 'T' frames where you don't need to climb over the seats. With wooden picnic tables Melbourne based specials are sometimes provided to make them even more affordable - especially on volume orders. Check out the larger range of outdoor wooden tables on our products page but if its not there or you want some special outdoor table that is slightly different, please give us a call. Remember that we manufacture to order.